Product #17405 | SKU LP36412 | 0.0 (no ratings yet) Thanks for your rating! 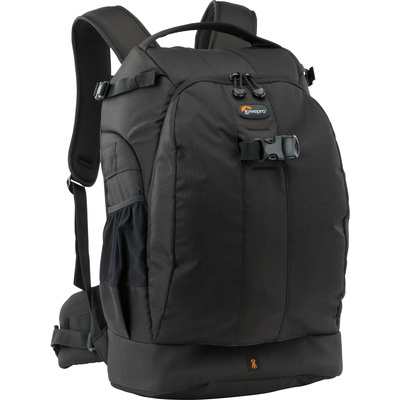 The Flipside 500 AW Backpack (Black) from Lowepro provides enough room for your pro DSLR and camera gear with a lightweight, easy to carry design. The designed-for-outdoors backpack features space for a pro-level DSLR with a grip and an attached 500mm f/4 lens, 1 to 2 extra bodies, 2 to 4 extra lenses, an external flash, memory cards, a tripod or monopod plus personal items. Thanks to the bag's all-weather design, you can take your gear with you anytime without worrying about water, dust, dirt, or sand damage. The backpack features a built-in all-weather cover that conveniently tucks into a separate compartment when not in use for quick access during inclement weather. The front zippered storage pocket contains enough room for personal items, including a tablet computer and other accessories plus Lowepro's Hideaway Tripod Mount System.